The government wants NPS (National Pension Scheme) to be the preferred investment vehicle for pension planning for majority of its citizens. Unfortunately as it happens with most of Government plans, NPS too has flaws which are holding investors back. To encourage investment in NPS, PFRDA (Pension Fund Regulatory and Development Authority) which regulates it have made certain changes with regards to early Exit, Interim partial withdrawal and exit on maturity rules through this official notification. 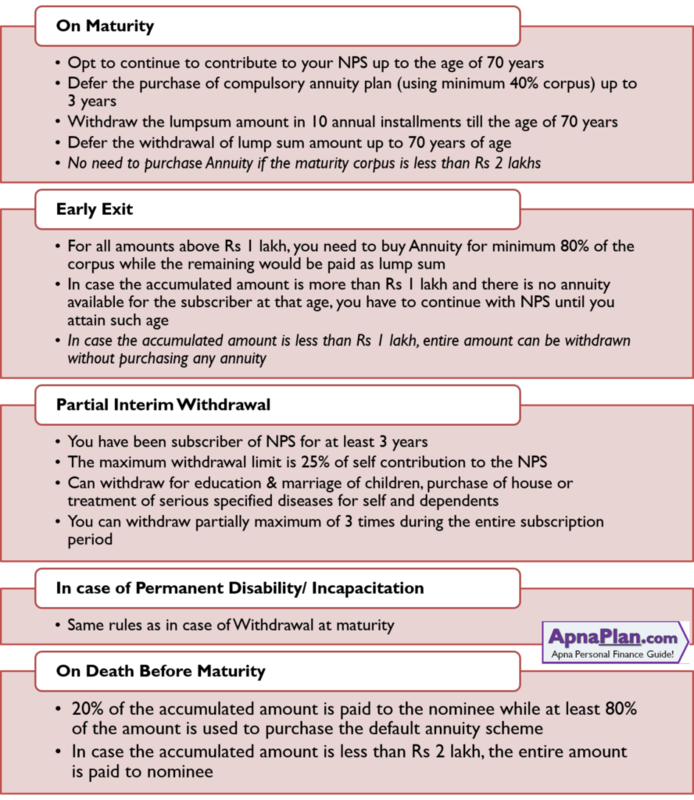 Defer the purchase of compulsory annuity plan (using minimum 40% corpus) up to 3 years. You will need to inform the concerned authorities at least 15 days in advance for taking this option. If subscriber’s death occurs during this deferred period, then the spouse must buy the annuity. Defer the withdrawal of lump sum amount up to 70 years of age. In this case you have to bear the cost of maintenance of account and other regular charges as applicable. The new rules are definitely an improvement above the existing ones but the compulsory annuity is still a problem. The annuity yields in India are still low and do not suit everyone. The good thing is with the new rules subscribers can remain invested in equity for a longer time and would not have to necessarily withdraw/purchase annuity at market lows. This also helps people who extend their retirement and are able to invest in NPS. In case the accumulated amount is more than Rs 1 lakh and there is no annuity available for the subscriber at that age, he has to continue with NPS until he attains such age. Typically insurance companies have minimum age criteria for annuities as 25 to 30 years of age while you can start NPS at the age of 18. So there can be few such cases. In case the accumulated amount is less than Rs 1 lakh, entire amount can be withdrawn without purchasing any annuity. For all amounts above Rs 1 lakh, you still need to buy Annuity for minimum 80% of the corpus while the remaining would be paid as lump sum. So in all the early exit from NPS has been made more restrictive. If the employer certifies that the subscriber has been discharged from the services on account of invalidation or disability, in such case, exit rules would be same as in the case of withdrawal at maturity. If subscriber is physically incapacitated or has suffered a bodily disability leading to his incapability to continue with his individual pension account under NPS, the subscriber needs to submit a disability certificate from a Government surgeon or Doctor (treating such disability or invalidation of subscriber) stating the nature and extent of disability. If all the conditions are satisfied the exit rules would be same as in the case of withdrawal at maturity. On Death, only 20% of the accumulated amount is paid to the nominee or legal heirs while at least 80% of the amount would be used to purchase the annuity scheme. In case the NPS amount is less than Rs 2 Lakh, the entire corpus as of that date is paid to the nominee or legal heirs. NPS account cannot be seized or attached by any court on appeal of creditors. You cannot change or cancel once the annuity has been purchased except during the free look period as specified by insurance company. There is no portability between Government NPS accounts and other accounts. So in case a government employee quits and joins a private company he would necessarily have to close this account and make early exit. NPS even after all the above changes should not be the preferred option for retirement planning mainly because of unfavorable tax treatment at maturity and compulsory buying of annuity using substantial corpus. You can accumulate much more and have more flexibility by investing in Equity Mutual Funds, PPF, EPF etc. I’ve joined govt service on 02 Dec 2014 and will retire on Aug 2026, on completion of 60 year, as my DOB 06-07-1966. You cannot calculate the minimum monthly pension as it depends on the contribution and return you have in NPS at the time of retirement. I have taken NPS for Rs.50,000/- in Jan.2017 and retired on 28.2.2017 after completing 60 years. Now please advice the procedure for withdrawal with time limit. Also if I want to continue for some more time when I can with draw the amount. I have taken NPS for Rs.50,000/- in Jan.2017 and retired on 28.2.2017 after completing 60 years. Now please advice the procedure for withdrawal with time limit and if I want to continue for some more time when I can with draw the amount as per my requirement. What about Tier II account – what are the provisions pertaining to the same & any changes & or clarifications about the same? eg are the tax benefits on 40% exemption on lumpsum withdrawals, extension by 10 yrs till age of 70 etc applicable to Tier II balances? You can deposit and withdraw form NPS Tier II anytime you want. Also there are no tax benefit on investment in Tier II account.